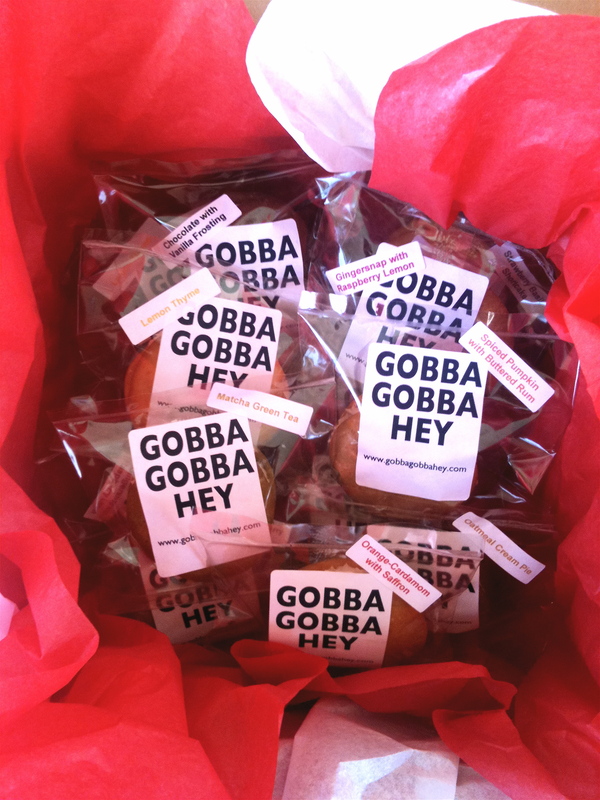 Well, here it is March 1st, and as promised I’m giving you a sneak peek at the Gobba Gobba Hey St Paddy’s Day Lucky Dozen Box that will be available for shipping and local delivery in SF just in time for March 17th. The box will have three flavors. The first is the Irish Coffee Gob with Bailey’s & Irish Whiskey frosting. 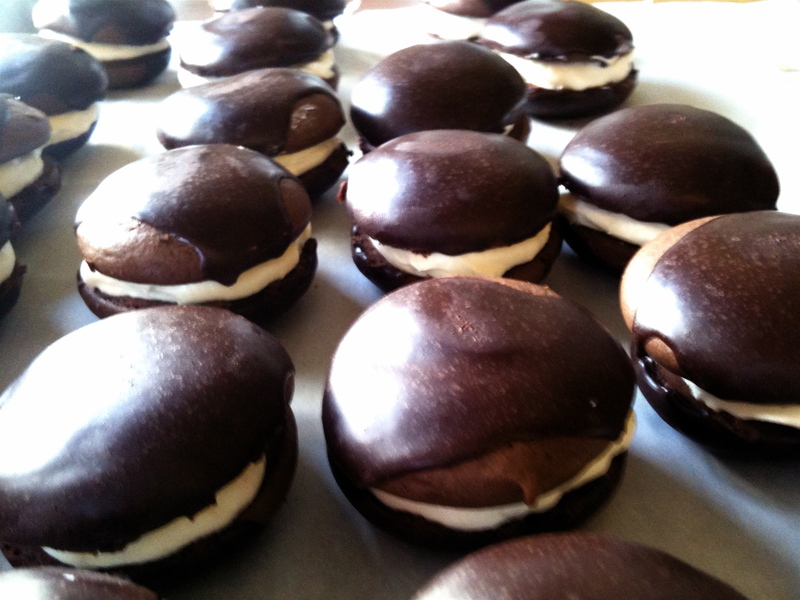 The second is Chocolate with Vanilla Guinness frosting. 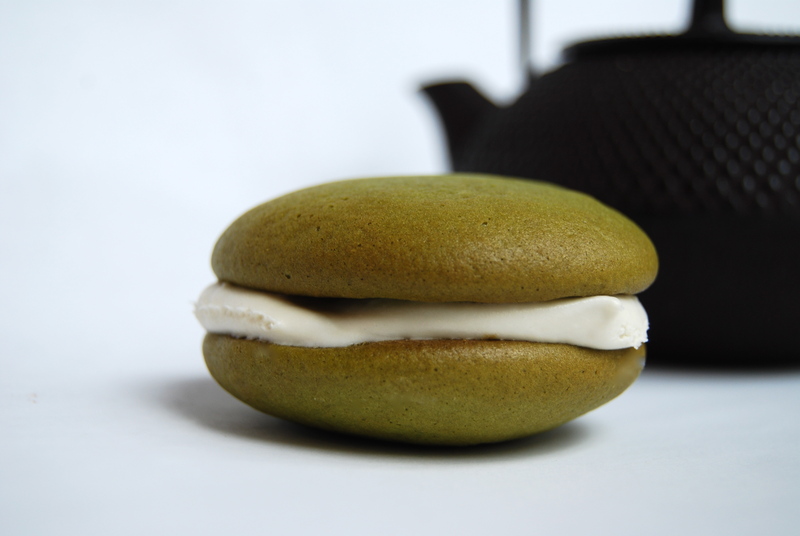 The third, well, I had to give you something green in the spirit of the holiday, so how about the Matcha Green Tea Gob with Lemongrass Ginger Frosting? 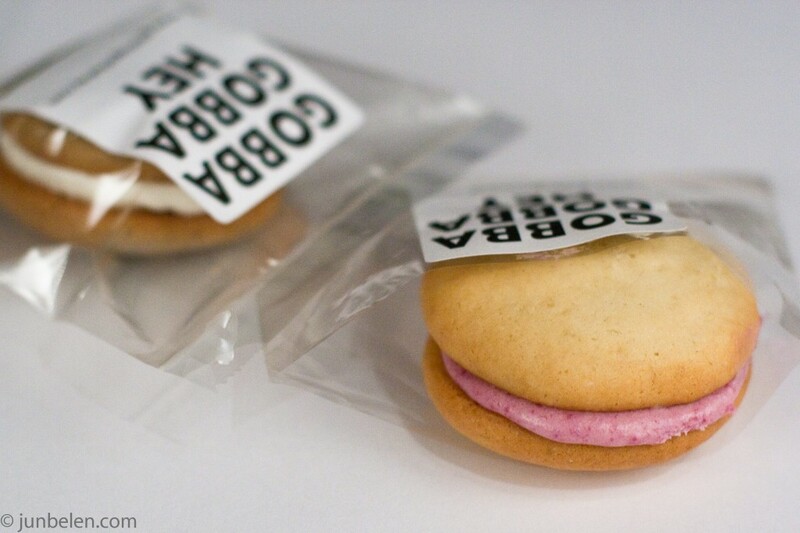 The box will consist of four gobs of each flavor. Shipping will be handled through Foodzie.com as always, with 2 day Fed Ex going out on March 15th. Local deliveries will be done by yours truly. I strongly advise reserving ASAP. These little guys are all made by hand so there is a limited quantity available. Want? Email now at gobbagobbahey at gmail.com . First come, first reserved. Sorry for the formatting and wild spacing here, but I put up a new blog post over at thewarmestroominthehouse.blogspot.com. Hopefully that link will work. 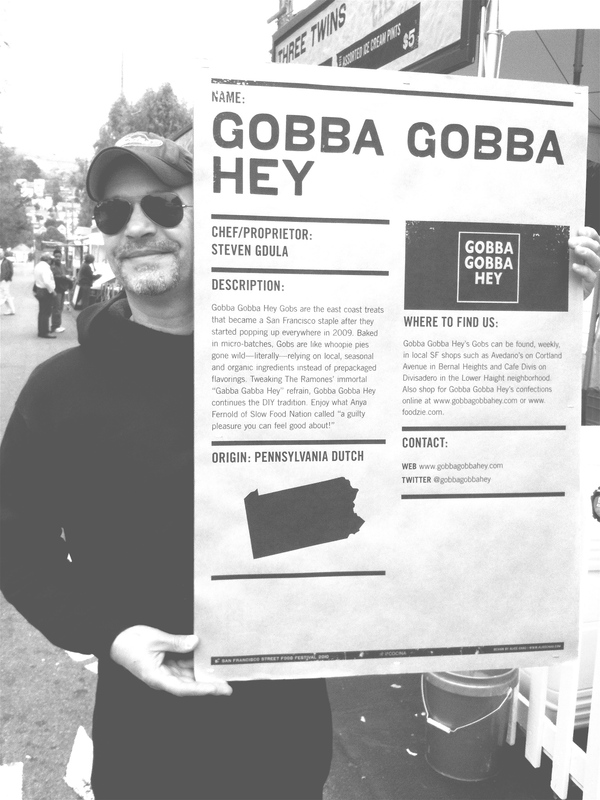 Lots going on in the world of Gobba Gobba Hey, including the impending release of Gobba Gobba Hey: A Gob Cook Book and the search for a truck. Yeah, that’s right. That kinda truck. You can read all about it if you follow that link above. In the meantime, thanks for staying with me the last few months. Your kindness has been truly appreciated. It’s hot. Too hot, in fact, to write an entirely new blog entry which would basically recap everything that I already said over at my other blog’s post. So, may I direct your eyes, and your browsers, over there for a few moments. 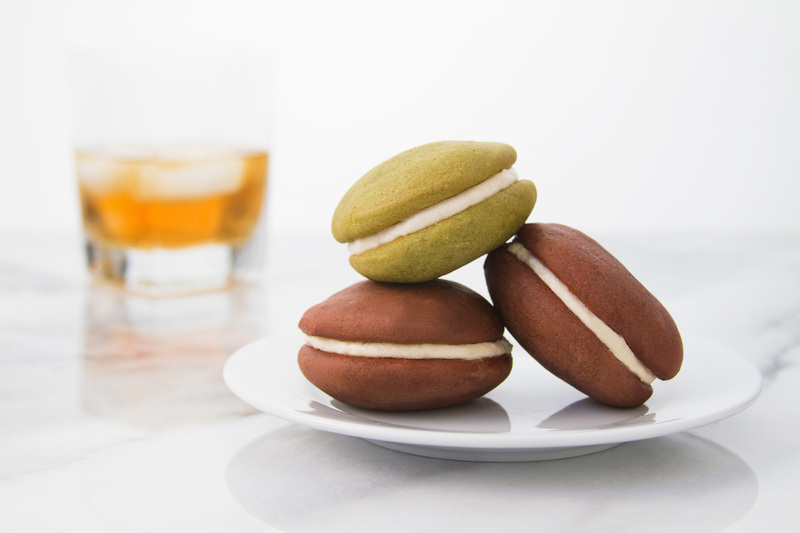 It’ll give you the skinny on what’s happening with me and my confections -Gobba Gobba Hey Gobs, those “delicious little taste bombs” as someone on Twitter dubbed them. Hope your summer is treating you well, and I hope the link below makes it onto your season’s reading list. It’s short and fast-paced, it’s full of information, and, of course, it has more than its fair share of shameless self-promotion. But before I go, I will say that I shared the love, and several of you might find yourselves mentioned in this post. Alright, I need to go and grab a Pimm’s or something. The Ube Gobs. I don’t think one ingredient has vexed me more than the purple yam known in Filipino-cuisine as ube. I was finally successful, as evidenced by the wonderful pix snapped by photographer and blogger Jun Belen, but not without logging some extra hours in my kitchen. My trials and travails with the tuber will accompany the recipe in the gob cook book, forthcoming from Bloomsbury USA in Spring 2011, but if you want to get a little preview now, you can hop on over to my other blog, The Warmest Room In The House, and get an expanded version of this entry. I’ve been taking the easy way out with these posts and I admit it, but gobbing has been a far more time-consuming process than I thought; I’m juggling baking, delivering, promoting, and of course, writing the book. 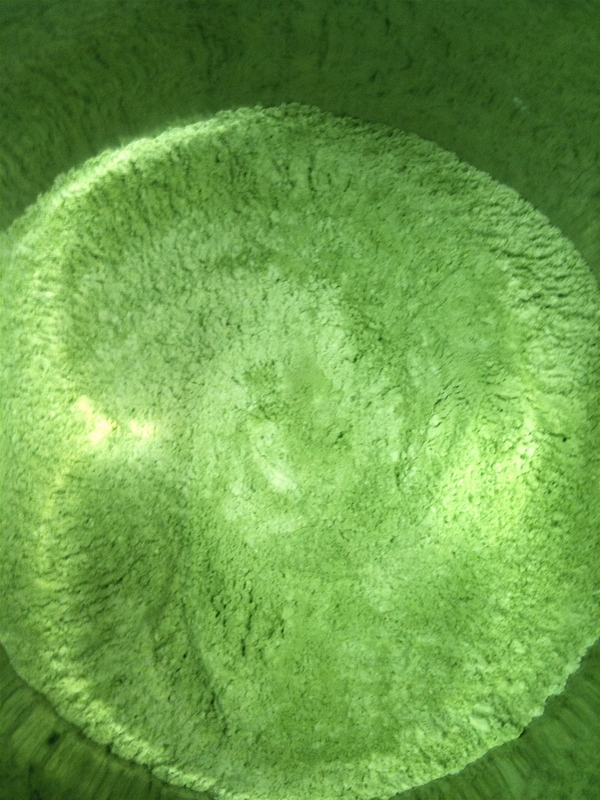 So, since I’ve been so negligent, and since I realized I was once again about to enter a brief bit of text before making my exit, I thought I’d at least include this – in my opinion – beautiful view of the Matcha Green Tea powder as it was being whisked into the dry ingredients to make the Matcha Green Tea Gob. This recipe will be in the Gobba Gobba Hey cook book, but in the interim, here’s a tip I’ll happily share if you’ve tried working with green tea powder: If like me, you spent a lot of time trying to work the powder into a paste, and then adding that paste in with the fats in your batter, I say “Stop!” Now if you’ve had success, great, but if you haven’t, you might want to try upgrading to a better quality powder – like Do brand, the name of which is supposed to have a little line above the “o” but which I’m unable to do since my keyboard doesn’t allow me to affect Japanese pronunciations – and whisking it in with your dry ingredients. It will take a little longer but it will be worth it. Plus you’ll get to see the pseudo-psychedelic patterns made if you’re using a reflective bowl. So the Valentine’s Day Gob Collection is up and ready for your consideration. I apologize again for the redirect. I dream of a world where all my posts live in harmony. Or at least a world where my tech skills are more proficient. In the meantime, please forgive my luddite ways. And click on through to the other side. It’s official. I have the flu. Not the Flu, but “a flu.” Apparently while the incidence of H1N1 cases in the Bay Area has dropped, a bug of less famous but nonetheless formidable nastiness has been making its rounds. And I caught it. The worst is certainly over, but…. OK, I apologize for this but I’m now going to redirect you here – thewarmestroominthehouse.blogspot.com – because until I find a way to get my Word Press and Blogspot entries to make nice with one another by transferring entries with a simple cut-n-paste that doesn’t lose any links or content, well, I’m going to have to enter text into both templates by hand. So I apologize for taking the easy way out this time. But I have a good excuse. 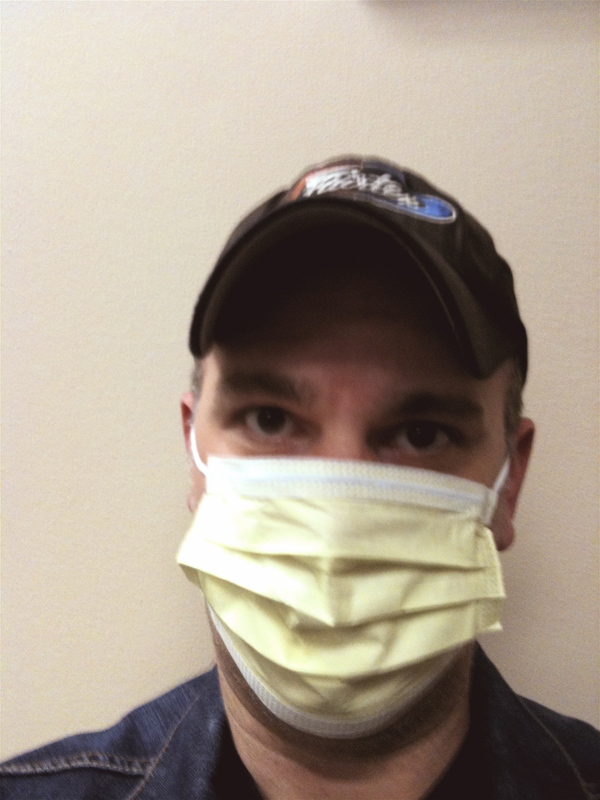 After all, I am just getting over the flu. Gobs will be back soon! I’m rarely at a loss for words. In fact I can get so revved up on a talking jag that I often have to apologize for going on, what I call, “autoblab.” I’ve also been known to utter words that don’t even exist. On occasion my left temporal lobe decides that the hundreds of thousands of words in the English language can’t effectively communicate what I’m trying to say and before I can stop myself, I’m speaking gibberish. What’s worse? I even conjugate this nonsense. Especially if caffeine or sugar or alcohol – or God forbid, all three – are involved. Throw in my western Pennsylvania accent that I’ve never totally lost and at times my speech can be almost indecipherable to the untrained ear. So I’m accustomed to the raised eyebrow or the questioning tilt of the head on the part of people with whom I’m conversing. But even I was surprised when earlier this year I found myself repeating the word “gob” to people who obviously had no idea what I’d just said; the fact I was asking them to buy this thing they’d never previously heard of only made the exchange more complicated and bewildering. But what a difference six months, and a certain amount of press coverage, can make. I’d like to think of 2009 as the year San Franciscans added the word “gob” – or perhaps a different meaning for the word – to their vocabulary. It’s been heartening but especially humbling the way the city has welcomed me and my baked goods into its culture since I officially debuted Gobba Gobba Hey Gobs in late May. This time last year, barely two months since my move from Washington, DC, I was scratching my head as I scoured San Francisco’s media outlets trying to find my place professionally and personally in my new hometown. My book The Warmest Room in the House had just made it onto the Chicago Tribune’s Best Books of 2008 List – not that that honor made any difference or brought with it any guarantees, though. With the economy tanking and options for freelance writers disappearing daily, the only thing certain in my life was uncertainty. Eventually I found my place at the table not by writing about food but by baking and selling one of my favorite confections from my childhood. Gobs. Now as 2009 comes to a close, it’s the gobs that have been included in some year-end round ups. Author and columnist Karen Solomon gave Gobba Gobba Hey a nod in her “Best Eats of 2009” survey in SF Station, and the readers of 7X7’s Bits + Bites column nominated gobs as one of the Big Eat Suggestions for 2010. There was even a mention of my baking in the December 4, 2009 issue of The New York Times, as well as in the December issue of Conde Nast Traveler. Yes, Virgina, there is a gob gift box this year. And yes, they were supposed to be available for order on Foodzie.com as of December 1st. But like other things that often arrive “just in time for the holidays,” my schedule suddenly filled up with some immediate responsibilities and as a result, through no one’s fault but my own, I missed the opportunity to open my Foodzie store in a timely manner. But that doesn’t mean that you and your loved ones have to miss out, especially if you’re looking to share some gob love this holiday season. 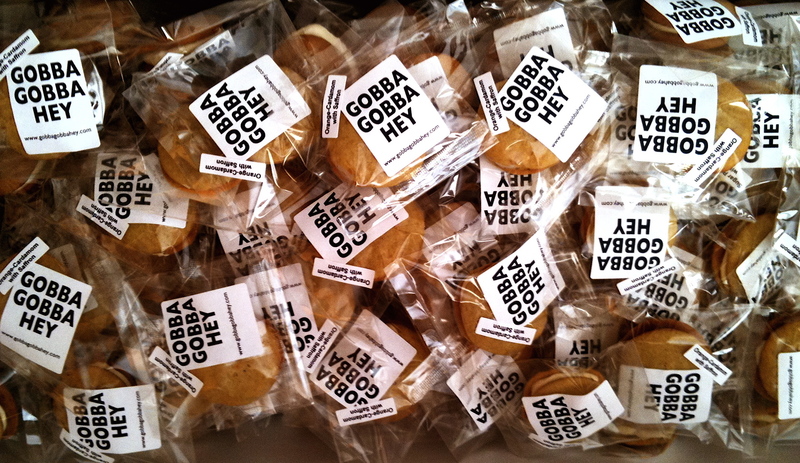 Here’s how you get your hands on this deliciousness: Email your order BY DECEMBER 13th to GobbaGobbaHey @ Gmail dot com. Include your name and address and telephone. Deliveries will take place between December 19th and 21st. If this seems too simple, and if you’re wondering if there is a catch, well, there sort of is: Like the best Boxed Gift Sets, there are only a limited number available. Get crackin’ and get gobbing people. And thank you all for the love and support in 2009. May 2010 bring all of you the right mix of the things you need and the things you want. -ps- For more info on the Boxed Set and All Things Gob, click yourself over to thewarmestroominthehouse.blogspot.com .